It is not the often that Sean actually gets into the kitchen and wants to cook something, so when he saw this recipe for lemon angel food cupcakes and said he wanted to make it I thought it would be a good idea. The recipe comes from the Food Network and it is one we saw Giada di Laurentiis make a few weeks ago. It looked pretty good and used some easy ingredients, including an angel food cake mix, which made it even easier for Sean to try. They looked like tasty treats that would be perfect for dessert and gave Sean a chance to impress us with his kitchen skills. For the lemon curd: Whisk together the egg yolks, lemon zest, lemon juice, sugar and salt in a medium saucepan. Set the saucepan over medium-low heat and cook, stirring constantly with a wooden spoon or spatula and making sure to scrape the sides and bottom of the pan, until the mixture is thick enough to coat the back of a spoon, about 3 to 5 minutes. Remove the mixture from the heat and add the butter, one piece at a time, stirring until it is smooth. Transfer the curd to a heat-proof bowl and cover the surface with plastic wrap to avoid a skin from forming. Refrigerate the curd until it is chilled and firm, about 30 minutes. For the cupcakes: Set racks on the upper and lower thirds of the oven and preheat the oven to 350 degrees. Line two muffin pans with cupcake liners. In the bowl of an electric mixer, combine the cake mix, lemon zest and lemon juice, and 1 cup of water. Beat the mix on low-speed for 30 seconds to incorporate, then raise the speed to medium and beat until the mixture is light and fluffy, about 1 minute. With a scoop or spoon, fill the liners three-quarters full with batter. Bake for about 15 minutes, or until the cupcakes are golden brown and the top feels dry. Let the cupcakes cool completely before filling and frosting, about 30 minutes. For the frosting: In the bowl of an electric mixer, combine the heavy cream, powdered sugar and vanilla. Whip the mixture until it is thick, about 2 minutes. Add the mascarpone cheese and beat the mixture until stiff peaks form. To assemble the cupcakes: Use a small spoon to make a shallow indentation in the center of each cupcake. Fill each indentation with 1 teaspoon of the lemon curd. 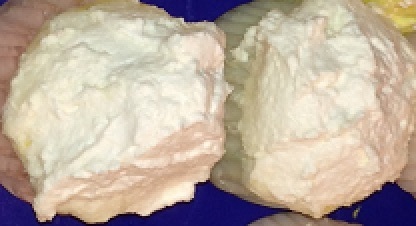 Use a spatula or piping bag to swirl a generous dollop of frosting over the top of each cupcake. Decorate with sprinkles or sanding sugar. We skipped the decorating with the sugar on top and just went with the cupcakes as they were. The cake had a nice lemon flavor and the curd was awesome inside each cupcake. Top it all off with the rich, creamy frosting and you have a really good dessert to serve. These are perfect for any type of summer party or buffet. We kept them chilled in the refrigerator because of the ingredients of the frosting even if the recipe does not indicate that they need to be stored this way. Anyway, I think the chilling added even more to the overall flavor and firmness.